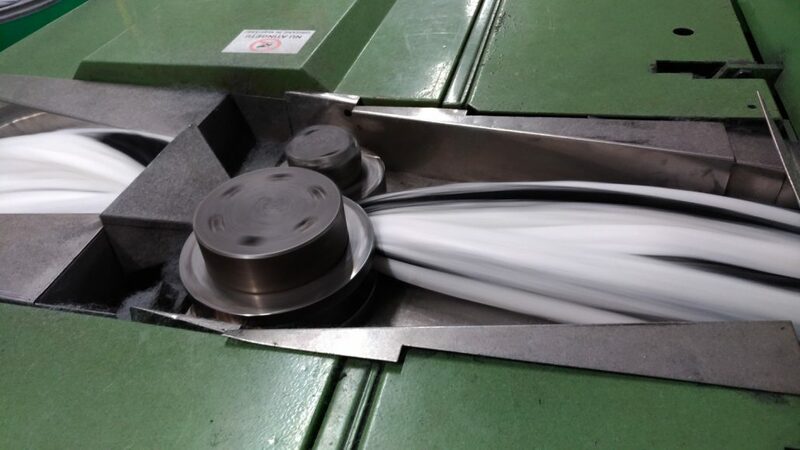 You are here: Home / News / News in the long fiber process: NEW TOMSIC GILL BOX AUTOLEVELLER! The new generation of Tomsic Gill Box autolevellers is equipped with 100% digital autolevelling system. The new system allows greater precision and excellent results in terms of the quality of the output sliver on your Gill Box. The new Gill Box autoleveller guarantees lower service costs, because it replaces many mechanical parts. Only the T&G scanning rollers are reused. Furthermore together with 100% digital scanning sensor and electronic draft are included a sophisticated output sliver monitoring and production data. • Quality improvement with the digital high – precision autolevelling system. • Digital calibration of the DLS sensor (Dual Laser Sensor) with one-touch adjustment procedure, without special tools and technicians (patented function). • Constant correction length and independent from main speed. • Autolevelling range up to +/- 30%. • Electronic draft, 100% digital, directly set from keyboard. • Output sliver quality monitoring: built in all TMS25-QM2 functions (only where it is physically possible to install). • Spare parts and service saving. • Automatic and manual d-T&G calibration. • Automatic and manual quality monitoring calibration. • Production and efficiency data. • Security key for data modification. TMS25-Link connection for long data storage and analysis including Normal and Inert test.